Are you looking for a career with countless opportunities to soar? The Federal Reserve supports a diverse workforce because it enables participation from all individuals, fostering a culture of professional enrichment and collaboration. Each of the 13 Federal Reserve entities provides a challenging work environment in a variety of fields with opportunities for you to grow and reach your fullest potential. 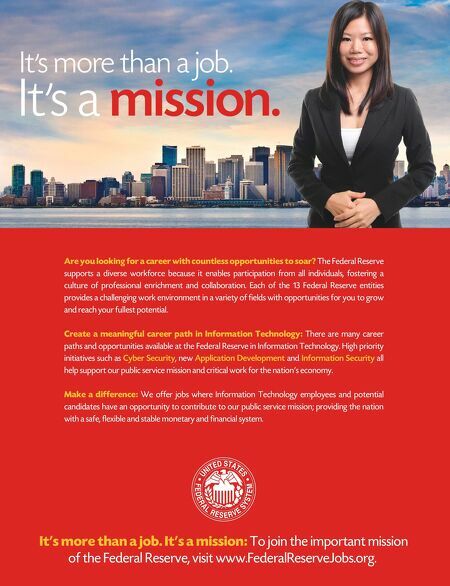 Create a meaningful career path in Information Technology: There are many career paths and opportunities available at the Federal Reserve in Information Technology. High priority initiatives such as Cyber Security , new Application Development and Information Security all help support our public service mission and critical work for the nation's economy. Make a difference: We offer jobs where Information Technology employees and potential candidates have an opportunity to contribute to our public service mission; providing the nation with a safe, flexible and stable monetary and financial system. It ' s more than a job. It ' s a mission. It's more than a job. It's a mission: To join the important mission of the Federal Reserve, visit www.FederalReserveJobs.org.